What would it be like to take a six-year trip around our Solar System? A major new science series from the BBC imagines just such a journey. After the more than 160 robotic missions we've now sent to the planets, we have a pretty good idea of what a human encounter with these neighbouring worlds might one day be like. And although of course our story is still fiction, it is, thanks to these trailblazing robotic missions, far more science than fiction. It was vital that we didn't break any laws of physics in creating the story; everything had to be possible, even if it was perhaps improbable. So I started by working out the trajectories and dates for the voyage. We needed to reach Venus, Mars, the moons of Jupiter, the rings of Saturn, Pluto and a comet and I'm proud to say we didn't shift a single planet or moon to make this mission work. With the trajectories computed we set about designing and building our spacecraft to do the job. The resulting designs, which emerged from a collaboration with our art department and EADS Space (a primary contractor for the European Space Agency's planetary missions), were shaped by the demands of the mission. A vast aerobraking disc and radiation shield, a nuclear fusion engine, solar panels, radiators, an active magnetic shield and centrifugal artificial gravity generators were all required to propel our crew between planets and return them safely to Earth. With so much work going into these designs it was easy sometimes to forget this was fiction. I would wake up in the middle of the night worrying that I was going to kill the crew, and the next day I'd be on the phone to the spacecraft designers checking that they were taking on board the advice from the space medical consultants we'd got on the series. The voyage is set in our time. In a way the story is as much an alternative history as it is a look to a possible future. Our starting point was that if we'd continued to progress at the pace seen in the 1960s (rather than the apparent backward steps we seem to have taken since). Nonetheless, the interiors of the spacecraft had to feel like they were of our time - more Apollo than Star Trek. I wanted viewers to watch this series and imagine themselves or friends they knew on this journey. The actors in the series went to "Space School"
It had to feel like footage of space shuttle flight decks, Apollo capsules or space station interiors that they might already have seen. Working closely with set builders who'd created the right looks for Apollo 13, Space Cowboys and the International Space Station seen in The Day After Tomorrow, we were able to create a contemporary look that I hope feels more believable. When it came to creating the surfaces of these alien worlds, we were determined to use parts of our own planet. Despite the divergent conditions on Venus and Mars, these planets are both rocky worlds like our own; they have great landscapes and substantial atmospheres with weather systems. It made sense to try to find Mars and Venus-like locations here on Earth to film in. Desert scenery was a must, but we also needed quite a specific look for Venus - a planet permanently shrouded in thick cloud. The Russian Venera landers photographed a surface with no direct sunlight or shadows. So we trawled Earth for a reliably cloudy desert. Our research led us to the north coast of Chile, where cold water currents from Antarctica bring cloudy skies to the coastal strip of desert. Luckily a little further inland under sunny skies, there was more scenery with the look we were after for our Mars landing site. The surfaces of Io, Pluto and the comet were built at Pinewood Studios and then extended digitally in post production. But there was one thing that was hard to pull off digitally: weightlessness. Tom Hanks once said that "to make a movie about space without going weightless would be like doing a movie of scuba diving and not going under water". We were of the same mind, and worked very hard with the Russian Space Agency Rosaviakosmos to film some real weightless sequences for the series. Loading our spacecraft sets on to their massive Illyushin-76 cosmonaut training aircraft we carried out a couple of parabolic flights - creating up to 30 seconds of weightlessness with each climb. The entire crew were weightless for a total of 15 minutes during the filming of the series - five times longer than the first American in space. No undertaking like this would be possible without a substantial Mission Control centre and the European Space Agency's human spaceflight centre in Holland provided the backdrop to this side of the series. The very helpful space agency handed it over for our filming just hours after their own astronaut Pedro Duque returned to Earth from the International Space Station (ISS). All the telemetry you see on their screens is live data from the ISS. When we put the headsets on we could hear the real astronauts talking to Houston. The resulting film might be the most realistic portrait of a voyage like this until we do it for real. It's over 30 years since humans last set foot on another world. And it could be a very long time before we go again. 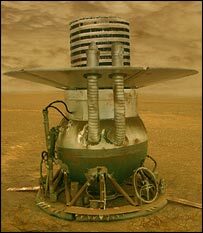 But I hope that this latest series from the BBC helps to keep the dream alive and supports our ingenious robotic missions that continue to show us the way to the planets. Space Odyssey: Voyage To The Planets starts on BBC One at 2100GMT on Tuesday 9 November. On the same night, The Robot Pioneers, a 50-minute film looking at the real missions to the planets which have provided the facts that underpin the main series, is broadcast on BBC FOUR at 2200GMT. Digital viewers can press their red button to access the science behind the scenes. The book of the series, co-written by Chris Riley, is available through BBC Books.